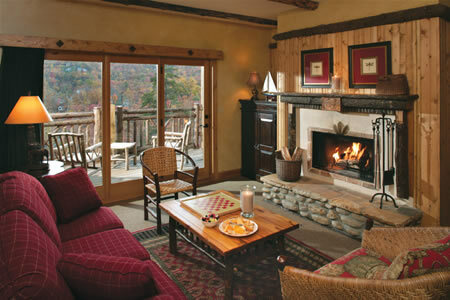 Buckberry Lodge provides the only all-suite luxury stay in the Smoky Mountains. Each suite boasts its own unique décor in the rustic flavor of the Adirondack style –– without sacrifice to finer comforts like generous soaking tubs, fireplaces, and private balconies. Depending upon size of suite, rates range from $180 to $460 nightly, and can be reserved online. Treat yourself to one of our elegant Grand Suites, where spacious, 900 square-foot rooms invite you in and pamper you in rustic elegance. 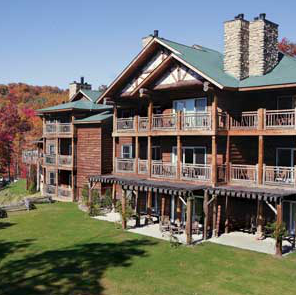 Exquisitely decorated with hand-picked furnishings, our largest suites feature a generous bedroom, living, and dining spaces along with lodge-styled fireplaces and decks overlooking the Smokies. A perfect blend of atmosphere and accommodation, Buckberry Grand Suites are unmatched. Amidst Oriental rugs, original art, and authentic Adirondack artifacts, our two-room Gallery Suites create the perfect haven to escape to. A large living room with fireplace and deck creates an inviting atmosphere in which to unwind and relax. Approximately 755 square feet of comfortable space, each suite affords the highest quality of luxury. Our premium Lodge Suites offer a large bedroom, private balcony and a sitting area romantically augmented with a dramatic fireplace and unique Adirondack-style décor. Bathrooms are exquisitely adorned with soaking tubs and the comforts one longs for when far from home.